Don't have a tf_english.txt in your resource folder or update it. Don't have a [i]tf_english.txt[/i] in your resource folder or update it. puoi1I don't know if this has been answer before but does anyone know how to change the color of the timepanels? Sorry for the spam but does anyone know how to do this? [quote=puoi1]I don't know if this has been answer before but does anyone know how to change the color of the timepanels? WiethoofdDon't have a tf_english.txt in your resource folder or update it. He is in there, I delete it, re downloaded it via steam and doesnt change a thing. @Bathory, in custom hud folders, the one in /tf/resource should always be there. Omg I'm such a dumbass... Thanks a lot. SirCupcakeApologies if this has been asked before, but the lastest update made the element that shows team health/classes/whatever while youre dead disappear. I'd really like to have that back. Help appreciated! So I still have this issue and after some testing it turns out that this isnt related to my custom HUD. Even without any custom HUD and after deleting the /tf/ folder contents and verifying game contents the issue persists. All I get is this http://i.imgur.com/mVN1mkY.jpg while other people in the server get their team status displayed on the left just fine. 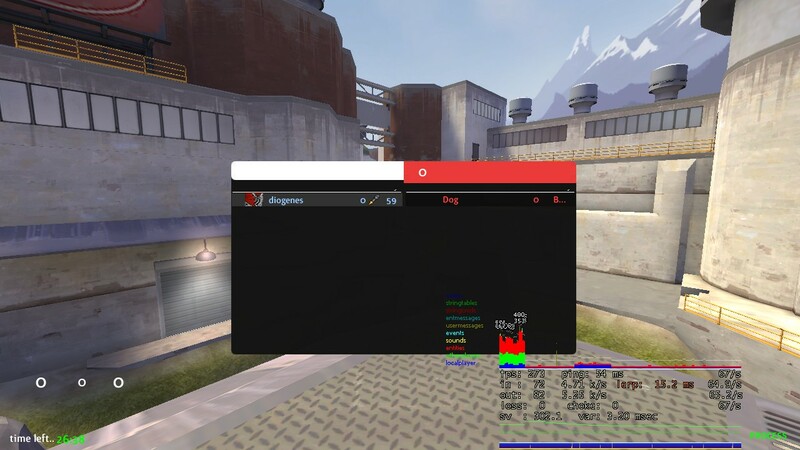 Sure you have cl_use_tournament_specgui 1 in autoexec or console or w/e? _KermitSure you have cl_use_tournament_specgui 1 in autoexec or console or w/e? no idea what turned that off, but changing it back to 1 fixed it. Thanks a lot! How do I move the Streamer's names under the stream image sort of like I am trying to illustrate here. I am sorry, but I don't quite know what you mean by "modify the look per stream"
Where are the parameters for the round timer located so I can hide them? Open the files, open vgui_drawtree 1 and tick Highligh Selected and see which elements get a red border around them when you navigate through the elements. Got it, thank you very much, sir. trying to add crispy's scoreboard to the updated m0rehud that was just posted, and for some reason in game it looks like this. Nothing has changed in the file except the font and color definitions to match the hud, and it has worked in previous huds (including m0rehud black) that I have added the scoreboard to. Any ideas? trying to add crispy's scoreboard to the updated m0rehud that was just posted, and for some reason in game it [url=http://i.imgur.com/pN5TD3u.jpg]looks like this[/url]. Wiethoofd@ Hidi HudMatchStatus.res now contains the timer and HudObjectiveTimePanel the backgrounds, the servertime, waiting for players, overtime and sudden death labels. Alright, I set all the values for visible in both files to zero. However, I've noticed a small grey (sometimes white) rectangle appearing at the top left corner of the screen. http://puu.sh/oVRt2/ea4bcbaa94.jpg Any guesses? How do you edit the notifications panel, and where? 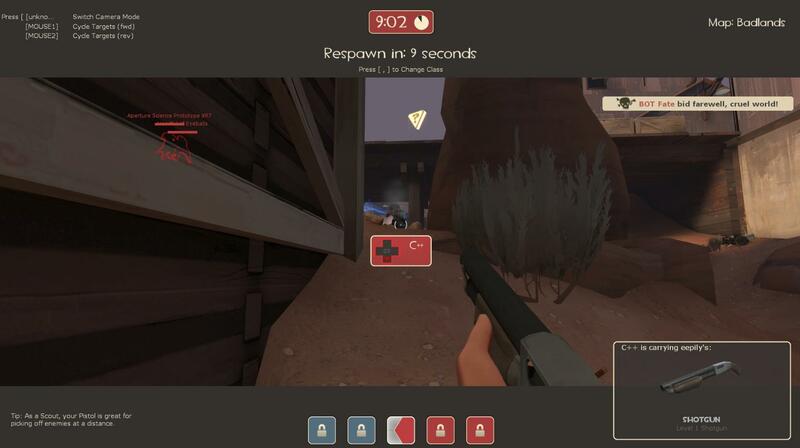 @Hidi That's a convar to indicate your healing target: hud_medichealtargetmarker and appears above the player being healed, set to 0 to disable. @Hidi That's a convar to indicate your healing target: [i]hud_medichealtargetmarker[/i] and appears above the player being healed, set to [b]0[/b] to disable. Wiethoofd@Hidi That's a convar to indicate your healing target: hud_medichealtargetmarker and appears above the player being healed, set to 0 to disable. You're a dank person, thank you very much! [quote=Wiethoofd]@Hidi That's a convar to indicate your healing target: [i]hud_medichealtargetmarker[/i] and appears above the player being healed, set to [b]0[/b] to disable. is there anyway to take menus, etc. from another hud and and transfer them into another hud to keep the actual hud (health, ammo)? Those are the ConfirmDialog*.res files in your resource/ui/econ folder. Those are the [i]ConfirmDialog*.res[/i] files in your resource/ui/econ folder. How do I change the size/color/position of the ubercharge % when you're being healed by someone else? TargetDataPanel for the UberCharge/Killstreak info in TargetID.res and CSecondaryTargetID in hudlayout.res to position the target ID in the hud. Any help on health cross colouring? Your best bet is looking at the hudanimations event for overheal and only have 1 line to change color instead of multiple to blink or with timings that aren't 0.0 or 0.001 to change the color instantly. Anyone here who knows how to remove the red and blue images in the tournamentspec?